Mom365's deep roots in photography means we love any opportunity to geek out with all things camera. 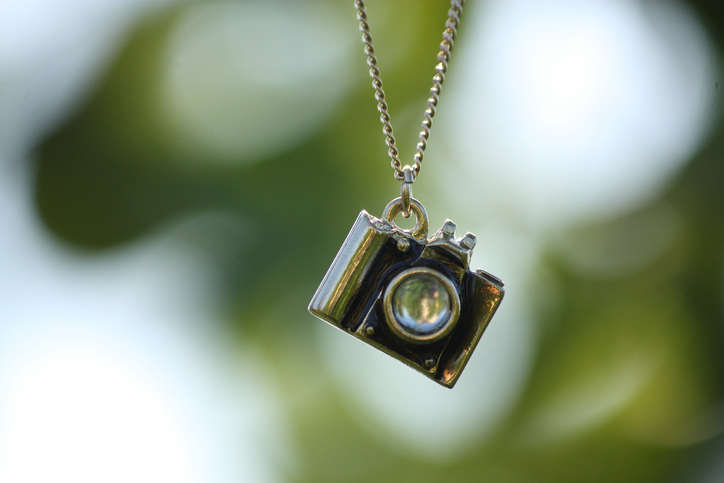 So we found a bunch of fun, lens-inspired jewelry and accessories on Etsy to celebrate the art of capturing your baby's every adorable, clickable moment. This silver ring also comes in bronze and will remind you to pick up that camera, now! $6.95 at Etsy's BevinBold shop. Drape yourself in retro cameras! Comes in white, beige, pink, and grey. $12 from Etsy's DouScarf shop. We heart this pink cotton bag for stashing lip balm—essential for selfies with your baby! $24 from Etsy's SoundOfHome shop. The virtual is made actual with these handmade earrings of the Instagram logo. We're favoriting these! $15 from Etsy's ColorMeKawaii shop. This tiny camera clip would be adorable in a little girl's hair. $5 from Etsy's MorbidStewArt shop. We heart this cute, practical handbag adorned with cameras. $45 from Etsy's TootsiePieDesigns shop. Keep that head toasty and camera-ready with a sweet headband. $25 from Etsy's LittleWorksOfGrace shop. A great size for popping to the store, this old-school camera is already full of charm. $15.32 from Etsy's BYKI shop. Snaz up your place and show your photo love with this chic, witty pillow. $24 from Etsy's goodsbygirl shop. A streamlined statement piece, this cool sterling silver ring would work on a man or a woman. $25 from Etsy's JenniferWood shop. Shout-out to your love of snaps and color with this sweet bauble. $21.95 from Etsy's SpotLightJewelry shop.